JBL Bar 2.1 est évalué 4.1 de 5 de 105. Rated 5 de 5 de BlankZ par Worth every penny. Beautifully clear sound, first JBL product I’ve bought and I’m astounded by its performance, deepest bass I’ve experienced from a household subwoofer (as it would be unfair to compare to subs from live concerts ect.) aswell as crispness on high notes with no distortion what so ever. Had the product nearly two months now (I think) and never ran into a single problem, minor hiccups at the start with trouble pairing subwoofer to soundbar when it was fresh out the box. Overall a brilliant product, I rate it very highly and am exited for when I eventually transition to something slightly more powerful such as the Bar 3.1 or the 5.1 if I happen to feel the need. Rated 5 de 5 de Jeff R par Pretty good Packs plenty of power for our living room with high ceilings. Am sure the 3.1 and up are super good though don't think my wife would like those due to how loud it could get. 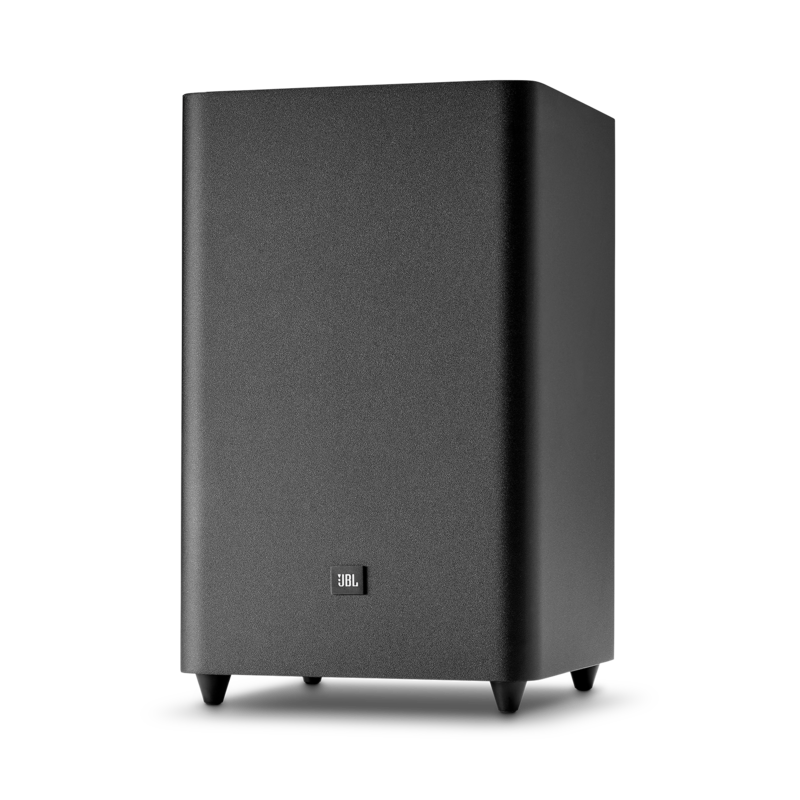 This one can fill the room with sound easily, base is very good, highs very good, and of course being JBL in itself let's you know the good quality to expect. Could have better instructions with it though just came to JBL site and downloaded then. Setup very easy, and up and going in under 5 minutes. First connect to the tv takes several seconds before heard sound, though just on initial setup. Very happy with it and when comes to audio it is hard to beat JBL. Rated 4 de 5 de MrGadget par Amazing sound Great clarity and bass. 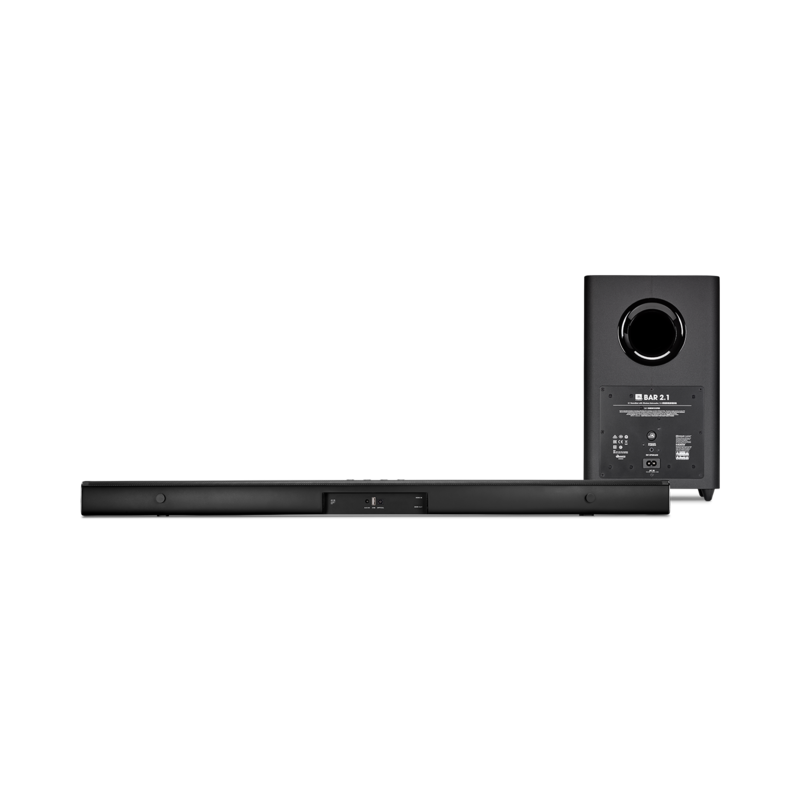 My kids use it for Just Dance and other Ps4 games as well as TV and movies. Uses HDMI or optical to connect to TV. I love the readout on the bar itself. I keep having audio sync issues though. The sound is behind the mouth moving. I must enable and disable my TV sound sync to fix it. It's either a software issue or the bar is fighting with my LG 4K TV sync since both the bar and the TV have sync options. Bottom line though is that it sounds really really good and hearing surround from a bar under the TV is really a trip! Rated 5 de 5 de APMSKI par Great Quality Product Offers great sound for an affordable cost. Very impressed with the bass quality and high volume clarity for being the lowest model that JBL carries. Wall mounting was extremely quick and easy. 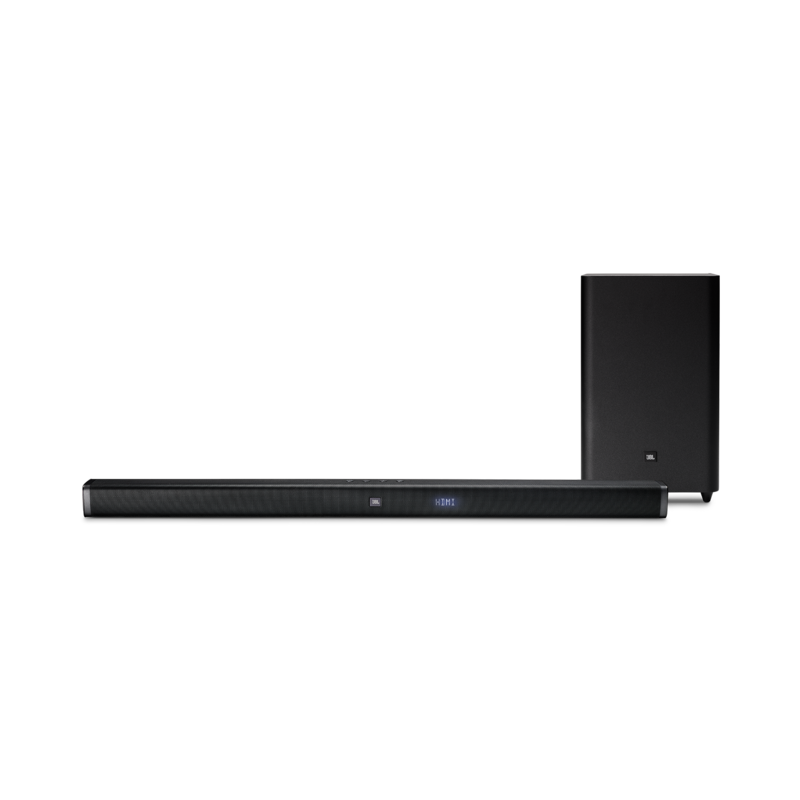 It has all the ports and functions you would need for a soundbar to have. 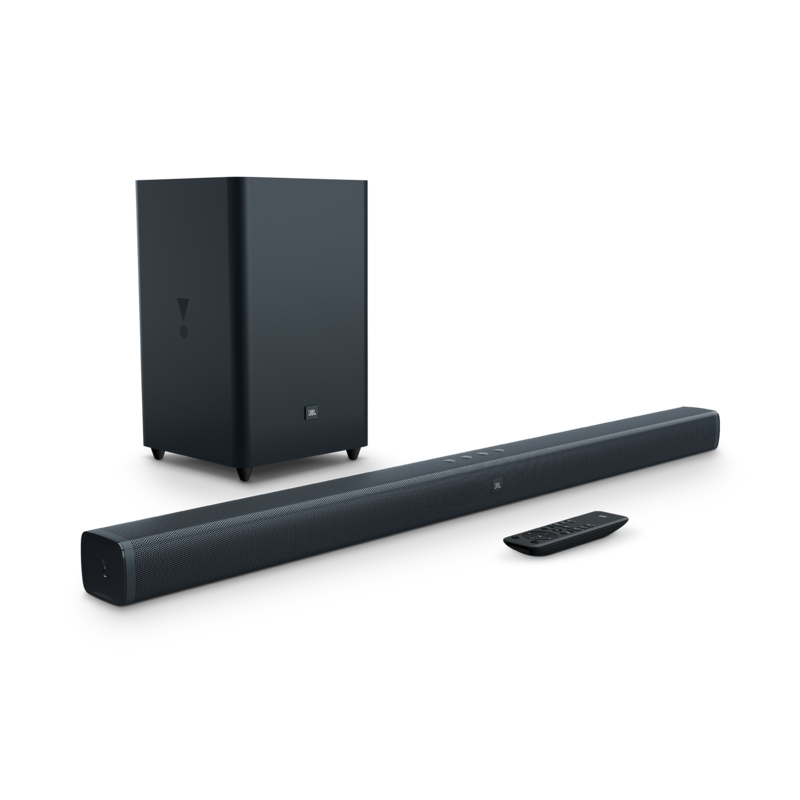 Obviously this system doesn’t compare to higher end home theaters, but this is the best 2.1 soundbar system compared to other brand names. 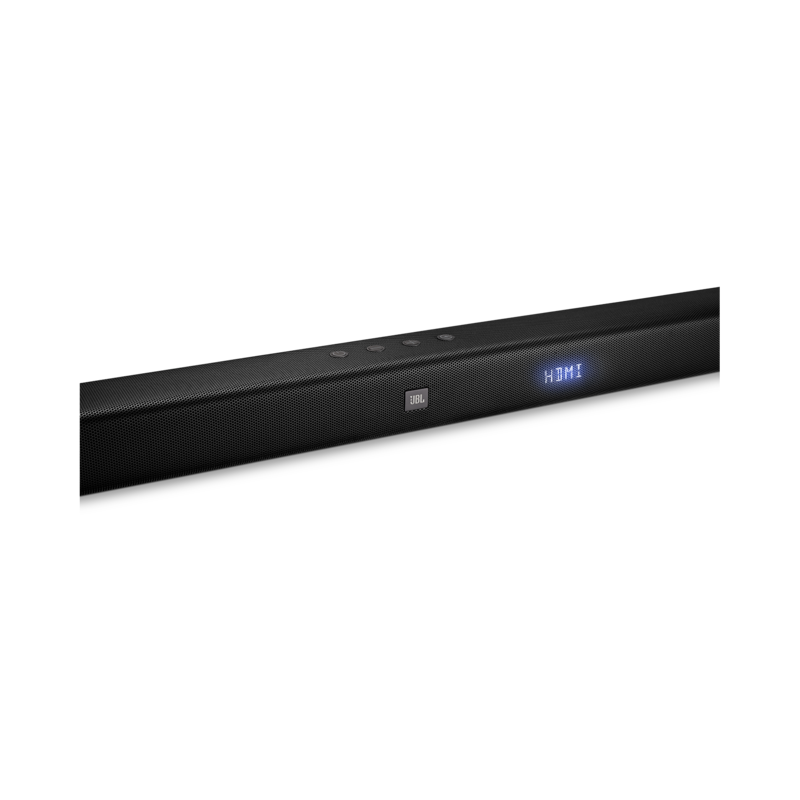 Rated 5 de 5 de bill42 par Great sound and features Great sound for the size and the price of this soundbar. I chose it over others because it has HDMI in and out which I need for my AppleTV. A slight problem which I have read other soundbars have as well, is that when audio is sent from Apple TV to soundbar, there is a second of silence before the soundbar detects the audio signal. After 1 second the display shows PCM and audio suddenly tuns on, in the middle of whatever sound is currently playing. This results in a jarring audio experience any time you pause for a second and then move the apple TV cursor around to select apps. It would be great if you could set the JBL soundbar to remain in PCM mode at all times intsead of constantly reverting to its un-named default sound transfer codec. I still give it 5 stars because this is a minor enough annoyance and everything else is as good as I could ever ask. Rated 5 de 5 de Sloterboater par Powerful sound I recently bought this for music and video games, anyone who says that this is underpowered doesn’t know what they’re talking about, the 200 watt subwoofer can be felt by my feet on the 2nd floor,(bar is on 1st floor) when it is on half volume. Full volume starts shaking things and the house rattles. The bass is punchy and the mids are really there in video games or tv. I would definetly recommend for a small room or even a medium size room like mine. Rated 5 de 5 de Ruben1992 par Super product Ik heb nu ongeveer 3 weken dit prachtige apparaat in bezit en ik ben er super tevreden over. Het installeren ging vrij soepel, alleen het duurde heel even voordat de basbox gekoppeld was met het apparaat. Het geluid is echt super en wat een volume komt hieruit! Mijn buurman is er in iedergeval niet blij mee! Het geluid is heel zuiver en vooral bij films hoor je de kwaliteit van dit product! Het enige puntje waar ik last van heb is als je hem verbind met je iPhone en het volume op je iPhone aanpast, dan gaat het volume verre van subtiel omhoog. Het is dan ineens te hard of te zacht! Verder vind ik het product een goede prijs kwaliteitsverhouding hebben!